Today was Day #8 of Chocolate and Brazil Theme Week; and Day #1 of Chocolate and Hazelnut Theme Week. 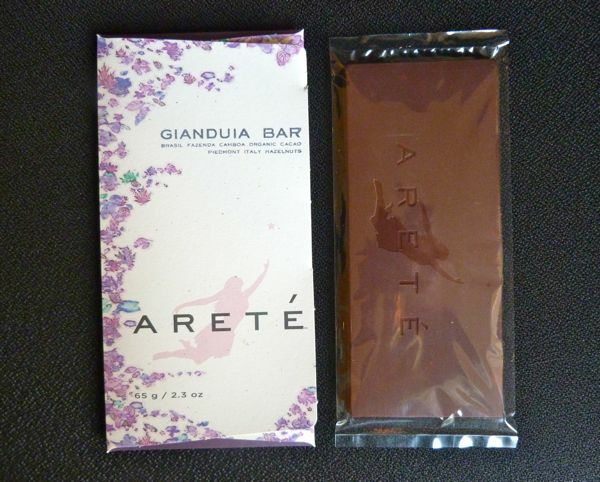 The Gianduia* bar from Arete Fine Chocolate (Milpitas, CA) was crafted using organic cacao from Brasil Fazenda Camboa (a farm/plantation in Bahia, Brazil); organic cane sugar; hand-pressed organic cocoa butter; and hazelnuts from Piedmont, Italy. 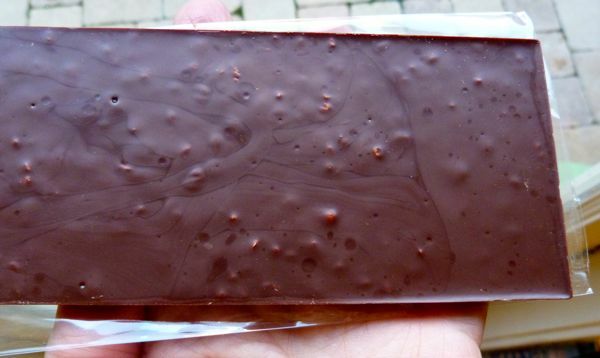 The faint nutty aroma of this bar doesn't quite prepare you for the very rich, immersive, dark hazelnut experience. Each bite broke off with a soft crunch, and yielded a long, leisurely, thick, nut-buttery melt. And with each bite, somewhere in my mind, I was surfing a wall of Piedmont hazelnut, tempered by fine chocolate on a fine sunny day somewhere. When I looked down, mysteriously, the bar had disappeared. Arete owners, David and Leslie Senk, mention on their website that they feel fortunate to work with Brasil Fazenda Camboa. This farm and others in Bahia had to rebuild after losses in the 1990s from Witches' Broom. This fungal disease appeared in 1989, and proved fatal to many cacao trees. More recently, the implementation of organic and other farming practices at Brasil Fazenda Camboa (e.g. less dense, uniform plantings and evaluation of disease-resistant varieties) may slow the spread of disease should it reoccur. Careful rebuilding efforts like this have led to more Brazilian chocolate in the U.S. in the past several years. 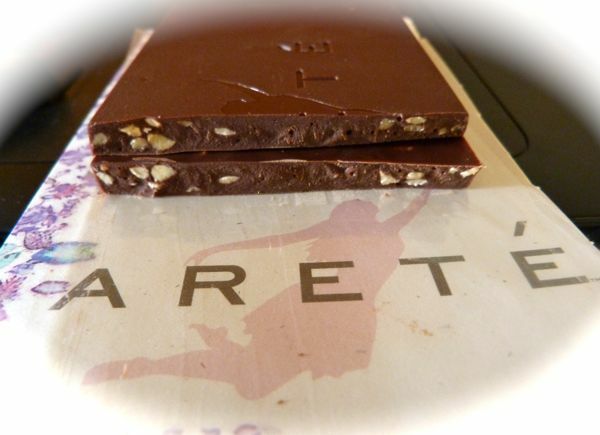 Arete Fine Chocolate also currently offers two other single origin Brazil bars (without nuts) with cacao from the same farm. 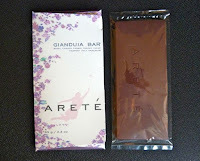 Gianduia (or Gianduja) refers to a ground chocolate and hazelnut spread (roughly 70% chocolate and 30% hazelnuts) that was, according to legend, created in Turin (Northern/Piedmont region of Italy) back in Napoleonic times.